When Gov. Benjamin G. Humphreys was removed from office on 15 June 1868, Pres. Andrew Johnson appointed Adelbert Ames provisional governor of Mississippi. At the time of his appointment, Ames was also the governor of the Fourth Military District, which had been established under federal Reconstruction policy and included Arkansas and Mississippi. Ames continued as both military and provisional governor until the reestablishment of civil authority on 10 March 1870. Ames, born in Rockland, Maine, on 31 October 1835, had been a highly decorated Union officer. He won a Congressional Medal of Honor at the First Battle of Bull Run and a battlefield promotion at Gettysburg. After he left the governor’s office, he and his wife, Blanche, the daughter of Gen. Benjamin Butler, established a family residence in Natchez. Ames was called a carpetbagger, a term of contempt that referred to northerners who held office in the South after the Civil War. Because Ames was a highly vocal advocate of black suffrage, he became enormously popular among Mississippi’s former slaves and emerged quickly as the leader of the Radical wing of the state’s Republican Party. As military governor, Ames garnered praise as well as great criticism for dismissing numerous state and local officials for having supported the Confederacy. He wrote to William Tecumseh Sherman that disputes in Reconstruction-era Mississippi occurred not between different parties “but between loyal men and a class of men who are disloyal,” and he governed in ways that limited the power of those he considered disloyal. 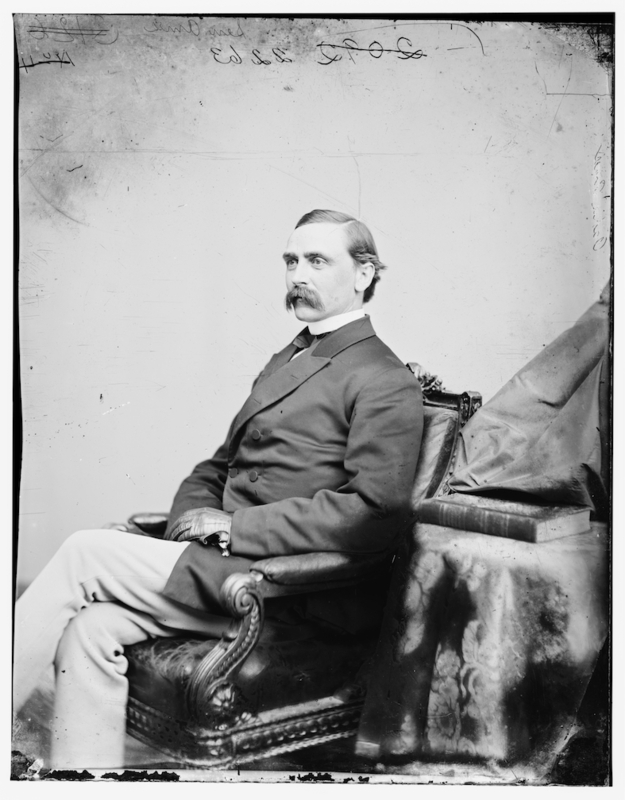 James L. Alcorn, a former Whig leader and wealthy Delta planter, was the leader of the moderate faction of the state’s newly established Republican Party. After Mississippi was readmitted to the Union in 1870, the legislature appointed Ames to the US Senate. In 1873, while still a senator, Ames ran for governor against Mississippi’s other senator, Alcorn, who had also served as governor in 1870–71. In the gubernatorial election most of the state’s black leaders supported Ames and most of the white leaders backed Alcorn. Ames won, and several blacks were elected to statewide office, including Lt. Gov. Alexander K. Davis. During Ames’s second administration, the state was torn by racial discord and political bitterness. When the legislature raised property taxes, a taxpayers’ convention assembled in Jackson in 1875 in protest. During the following summer, racial disturbances occurred in several cities, with the most serious taking place in Vicksburg. The fall elections of 1875 saw more violent disturbances, and Ames called out the state militia to maintain order. His actions incited more unrest, and widespread violence, fraud, and voter intimidation occurred during the election. Ames called for federal intervention to combat the violence, but Pres. Ulysses S. Grant declined. The Democratic Party secured a large majority in the state legislature and regained control of most county governments. The legislature convened in January 1876 and brought impeachment charges against Ames and several other Republican officials, including Davis. In most cases, especially those of Ames and Davis, the charges were politically motivated. When it became apparent that Ames would be convicted and removed from office, his lawyers arranged a compromise with the state legislature. Ames resigned on 29 March 1876, and the charges were dropped. Davis was removed from office through impeachment. Ames subsequently returned to Lowell, Massachusetts, and remained there until his death at age ninety-eight on 12 April 1933.